I have just made up a cotinuation track - so as to enable the slugs to drop all the way to the boom. If the track is successful - I may then change the reefing. As it is I have to manually drop the slugs out to set a reef. 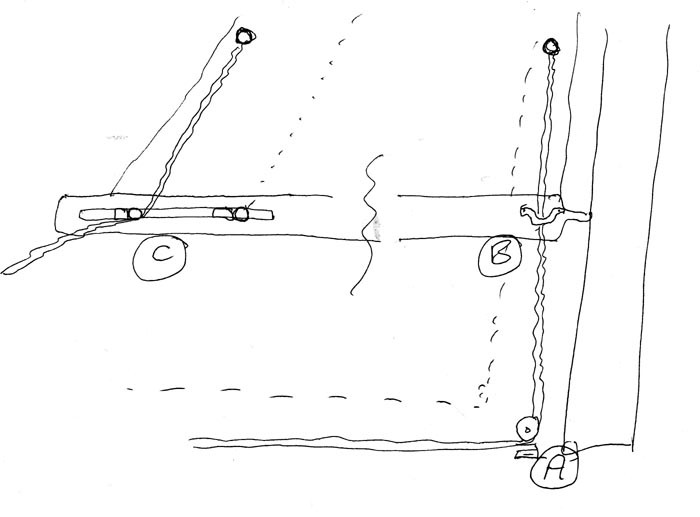 A simple system is to use a single line to pull down the mast cringle - then tension the boom end lines the 'other way' through the jiffy reefing track, back to end of the boom. They could just be wound around the boom end and made off to a jam cleat. Easy to do and reach. At present I have standard jiffy reefing - hooks at the mast - and lines led up to two reefs from the Barton track with sheaves. These tie off fowards to cleats by the mast end of the boom. I have a spinlock clutch, three way - currently for, Main Halyard - Topping lift - Boom vang. Of these, only the main halyard needs the coachroof winch. The topping and vang could be just led back to a simple jammer and horned cleat. This would leave the two spare clutches for the two reefs. If my slugs can drop right to the boom - then the simplest way to pull down the mast end cringles is just as shown at B - straight down through a boom mounted eye to a deck mounted upstand block at A . This allows some movement of boom right through the full sweep of the mainsheet set. The lines will stretch enough to accomodate any tension thrugh the arc of the boom. I can reach the boom end easy enough - so the present lines could go aft to the boom end. Its less mess along the boom. The first reef can end at a knot just past the Barton track sheave - or maybe an 'eye' to grab. Pulled tight, wound around the boom end and locked into a jammed cleat. The mast lines could be a double upstand block - two side by side eyes on the boom. Both reefs would have to be pulled down the same side. If the first pulls to starboard, the flap will set port - then the next will have to be the same. Essentially all I need to alter it is one double standup block - and maybe a spinlock turning bar ( which are not that expensive for threeway ) I then need to make off the topping ( could just be a horned cleat ) and maybe a jamming device for the vang. By the time you price even a cam action cleat - you may as well buy a two way spinlock simple lever jammer. They are much cheaper than the 'clutches' - they just lock the rope off. The main problem would probably be locating the diverter bar - they are pig to fix through double cabin roof mouldings ! I do have a third reef in the main - which can be lashed if needed. I have never used it. If its that bad I just set a jib and use the engine. Different if one is making long passages of weeks duration. My reasons for doing this is basically - when single handed, one can end up not having main up when one should - and the easier it is to reef, the more use one makes of the main. I've learned a lot recently, especially when sailing with Ian - who makes good use of the main even when motoring head to wind. We will often have a full main up - even when its impossible to set the gib given our course to wind. I can drop the main easily and quite safely - but its setting a reef alone - especially when its a difficult sea - that leads you to leave it down, often motoring when I could be sailing - and the more you 'sail' the more you learn.